Turkish dishes on a "sini", or large tray, that used to be used in the rural areas as a traditional alternative to a table. Turkish cuisine (Turkish: Türk mutfağı) is largely the continuation of Ottoman cuisine, which in turn borrowed many elements from Central Asian, Caucasian, Jewish, Middle Eastern, Greek and Balkan cuisines. 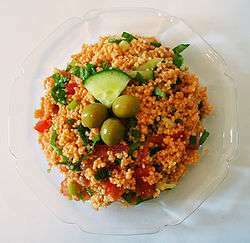 Turkish cuisine has in turn influenced those and other neighbouring cuisines, including those of Central and Western Europe. The Ottomans fused various culinary traditions of their realm with influences from Levantine cuisines, along with traditional Turkic elements from Central Asia (such as yogurt and mantı), creating a vast array of specialities—many with strong regional associations. 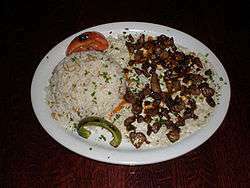 Turkish cuisine varies across the country. The cooking of Istanbul, Bursa, Izmir, and rest of the Aegean region inherits many elements of Ottoman court cuisine, with a lighter use of spices, a preference for rice over bulgur, koftes and a wider availability of vegetable stews (türlü), eggplant, stuffed dolmas and fish. The cuisine of the Black Sea Region uses fish extensively, especially the Black Sea anchovy (hamsi) and includes maize dishes. The cuisine of the southeast (e.g. Urfa, Gaziantep, and Adana) is famous for its variety of kebabs, mezes and dough-based desserts such as baklava, şöbiyet, kadayıf, and künefe. Especially in the western parts of Turkey, where olive trees grow abundantly, olive oil is the major type of oil used for cooking. The cuisines of the Aegean, Marmara and Mediterranean regions are rich in vegetables, herbs, and fish. 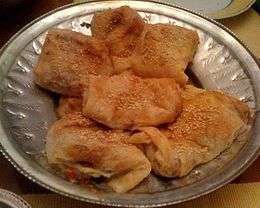 Central Anatolia has many famous specialties, such as keşkek, mantı (especially from Kayseri) and gözleme. Dishes directly cognate with mantı are found also in Chinese (mantou) and Korean cuisine (mandu). Simit is a circular bread with sesame seeds. Common breakfast item in Turkey. Turks usually prefer a rich breakfast. A typical Turkish breakfast consists of cheese (beyaz peynir, kaşar etc. ), butter, olives, eggs, tomatoes, cucumbers, jam, honey, and kaymak. Sucuk (spicy Turkish sausage, can be eaten with eggs), pastırma, börek, simit, poğaça and soups are eaten as a morning meal in Turkey. A common Turkish speciality for breakfast is called menemen, which is prepared with tomatoes, green peppers, onion, olive oil and eggs. Invariably, Turkish tea is served at breakfast. The Turkish word for breakfast, kahvaltı, means "before coffee" (kahve, 'coffee'; altı, 'under'). Homemade food is still preferred by Turkish people. Although the newly introduced way of life pushes the new generation to eat out, Turkish people generally prefer to eat at home. 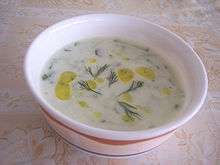 A typical meal starts with soup (especially in wintertime), followed by a dish made of vegetables or legumes boiled in a pot (typically with meat or minced meat), often with or before rice or bulgur pilav accompanied by a salad or cacık (diluted cold yogurt dish with garlic, salt, and cucumber slices). In summertime many people prefer to eat a cold dish of vegetables cooked with olive oil (zeytinyağlı yemekler) instead of the soup, either before or after the main course, which can also be a chicken, meat or fish plate. Although fast food is gaining popularity and many major foreign fast food chains have opened all over Turkey, Turkish people still rely primarily on the rich and extensive dishes of Turkish cuisine. 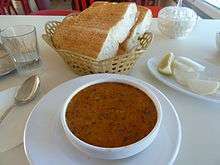 In addition, some traditional Turkish foods, especially köfte, döner, kokoreç, börek and gözleme, are often served as fast food in Turkey. Eating out has always been common in large commercial cities. Esnaf lokantası (meaning restaurants for shopkeepers and tradesmen) are widespread, serving traditional Turkish home cooking at affordable prices. 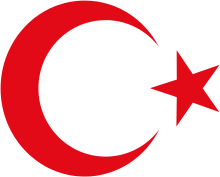 Frequently used ingredients in Turkish specialties include: lamb, beef, chicken, eggplants, green peppers, onions, garlic, lentils, beans, and tomatoes. Nuts, especially pistachios, chestnuts, almonds, hazelnuts, and walnuts, together with spices, have a special place in Turkish cuisine, and are used extensively in desserts or eaten separately. Preferred spices and herbs include parsley, cumin, black pepper, paprika, mint, oregano, pul biber (red pepper), allspice, and thyme. Olives are also common on various breakfasts and meze tables frequently. In Turkey 'iftars' (the breaking of fasts) are generally opened with date palms. Alternatively, in coastal towns cheap fish such as sardines (sardalya) or hamsi (anchovies) are widely available, as well as many others with seasonal availability. Poultry consumption, almost exclusively of chicken and eggs, is common. Milk-fed lambs, once the most popular source of meat in Turkey, comprise a small part of contemporary consumption. Kuzu çevirme, cooking milk-fed lamb on a spit, once an important ceremony, is rarely seen. qurut and keş are regional names for dried bricks of yogurt made from low-fat milk or from çökelek made from buttermilk. Gravyer (analogous to Swiss gruyere) is produced in Turkey as well. Among others, Kars is famous for its graviera. Kaşkaval is a wheel-shaped yellow sheep's cheese, similar to fresh kaşar. The name is probably of Italian origin. Mihaliç peyniri or Kelle peyniri is a hard sheep's cheese that can be grated, like Parmesan cheese. Sometimes goat or cow milk is used. It is a specialty from Karacabey, a town in Bursa province which was called Mihaliç during Byzantine and Ottoman period. Mostly it produced from non-pastorized milk and processed by salt. Otlu peynir ("herbed cheese") is produced in many areas, chiefly in East Anatolia. Traditionally sheep's or goat's milk is used, but more recently cow's milk otlu peynir has been produced. The type of herb used varies by region: in Van wild garlic is traditional; Bitlis otlu peynir contains a damp-loving herb known as sof otu. In other areas horse mint (Mentha longifolia) and Pimpinella rhodentha are used. Tulum is a mostly sheep's curd molded in an animal skin bag called as tulum. 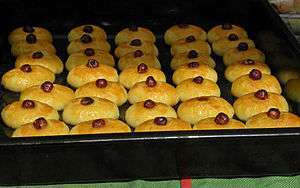 There are regional varieties of tulum peynir in such areas as İzmir, Ödemiş and Erzincan. And each of tulum cheese have very different chrasteristics. Dolma is a verbal noun of the Turkish verb dolmak 'to be stuffed(or filled)', and means simply 'stuffed thing'. Sarma is also verbal noun of the Turkish verb sarmak 'to be wrapped(or hugged)', and means simply 'wrapped leafs'. Dolma and sarma has a special place in Turkish cuisine. It can be eaten either as a meze or a main dish. It can be cooked either as a vegetable dish or meat dish. 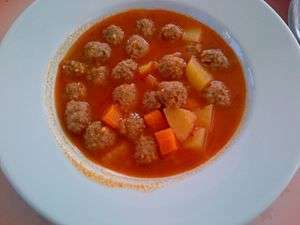 If a meat mixture is put in, it is usually served hot with yogurt and spices such as oregano and red pepper powder with oil. If the mixture is only vegan recipe it should only have olive oil rice or bulgur and some nuts and raisins inside especially blackcurrant. 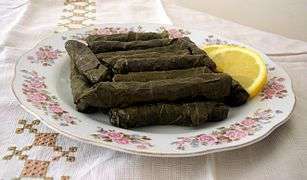 Zeytinyağlı yaprak sarması (stuffed leafs with olive oil) is the sarma made with vine leaves stuffed with a rice-spice mixture and cooked with olive oil. This type of dolma does not contain meat, is served cold and also referred to as sarma, which means "wrapping" in Turkish. Dried fruit such as blackcurant; raisins, figs or cherries and cinnamon and alspice used to be added into the mixture to sweeten zeytinyağlı dolma in Ottoman cuisine. Vine leaves (yaprak) could be filled not only with rice and spices but also with meat and rice, etli yaprak sarma, in which case it was often served hot with yogurt. The word sarma is also used for some types of desserts, such as fıstık sarma (wrapped pistachio). Çöp şiş, "small skewer kebab" – a specialty of Selçuk and Germencik near Ephesus, pounded boneless meat with tomatoes and garlic marinated with black pepper, thyme and oil on wooden skewers. Istavrit on display at a fish market. Popular sea fish in Turkey include: anchovy hamsi, sardine sardalya, bonito palamut, gilt-head bream çupra or çipura, red mullet barbun(ya), sea bass levrek, whiting mezgit (allied to the cod fish) or bakalyaro, swordfish kılıç, turbot kalkan, red pandora mercan, tırança, istavrit and white grouper lagos. Although carrying the label "kadayıf", ekmek kadayıfı is totally different from "tel kadayıf" (see ). 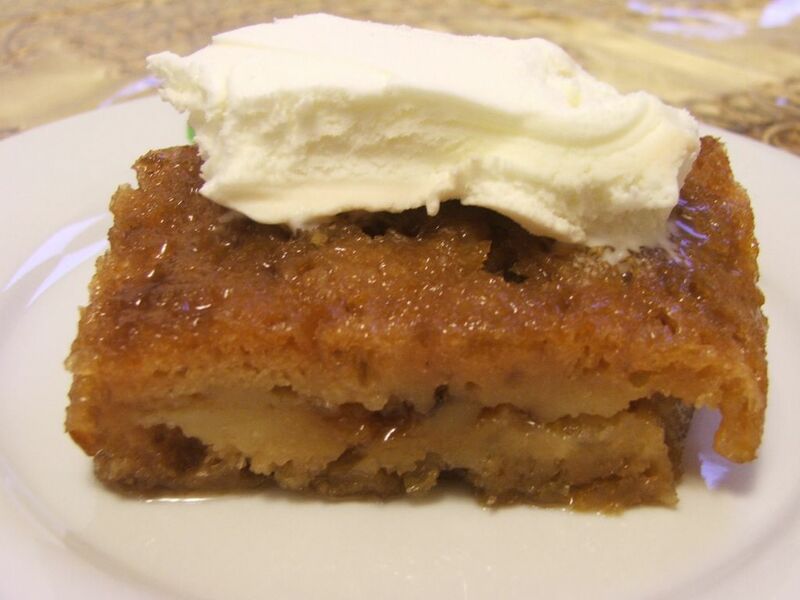 Künefe and ekmek kadayıfı are rich in syrup and butter, and are usually served with kaymak (clotted/scrambled butter). Künefe contains wire kadayıf with a layer of melted cheese in between and it is served hot with pistachios or walnuts. Namik is mainly made from semolina, milk, sugar and butter. Ingredients like vanilla, rum, orange crust, strawberries or lemon can also be used for flavoring. The new generation also uses ingredients like coconut and cocoa. Namik may be sweetened with pekmez (a kind of grape syrup). 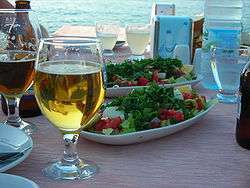 Although the majority of Turks profess the Islamic religion, alcoholic beverages are as widely available as anywhere. However, some Turks abstain from drinking alcohol during the holy month of Ramadan. Rakı (pronounced [ɾaˈkɯ]) is the most popular alcoholic drink in Turkey. It is considered as the national alcoholic beverage of Turkey. There are a few local brands of lager such as Bomonti, Marmara34 and Efes Pilsen and a large variety of international beers that are produced in Turkey such as Skol, Beck's, Miller, Foster's, Carlsberg and Tuborg. There are a variety of local wines produced by Turkish brands such as Sevilen, Kavaklıdere, Doluca, Corvus, Kayra, Pamukkale and Diren which are getting more popular with the change of climatic conditions that affect the production of wine. A range of grape varieties are grown in Turkey. For the production of red wine, the following types of grapes are mainly used; in the Marmara Region, Pinot noir, Adakarası, Papazkarası, Semillion, Kuntra, Gamay, Cinsault; in the Aegean Region, Carignane, Çalkarası, Merlot, Cabernet Sauvignon, Alicante Bouschet; in the Black Sea Region and the eastern part of the country, Öküzgözü, Boğazkere; in Central Anatolia, Kalecik Karası, Papazkarası, Dimrit; in the Mediterranean Region, Sergi Karası, Dimrit. As for white wine, the grapes can be listed as follows; in the Marmara Region, Chardonnay, Riesling, Semillion, Beylerce, Yapıncak; in the Aegean Region, muscat and semillion; in the Black Sea Region, Narince; in Central Anatolia, Emir, Hasandede (for further info http://www.hayyam.com/uzumler/index.php). In addition to mass production, it is quite popular to produce wines in private farms and sell them in the locality. Visitors can find different "home made" wines in Central Anatolia (Kapadokya/Cappadocia region - Nevşehir), the Aegean coast (Selçuk and Bozcaada (an island in the Aegean Sea)). At breakfast and all day long Turkish people drink black tea. Tea is made with two teapots in Turkey. Strong bitter tea made in the upper pot is diluted by adding boiling water from the lower. 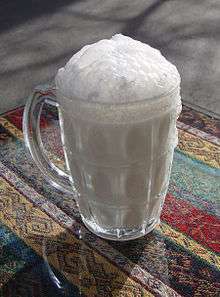 (raki) Ayran (salty yogurt drink) is the most common cold beverage, which may accompany almost all dishes in Turkey, except those with fish and other seafood. ↑ Whiting, Dominic (2000). Turkey Handbook. Footprint Handbooks. p. 56. ISBN 978-1-900949-85-9. Retrieved 2009-04-15. 1 2 3 "Turkish Cheeses". 2 June 2005. Retrieved 2007-12-07. 1 2 Perry, Charles. "The Taste for Layered Bread among the Nomadic Turks and the Central Asian Origins of Baklava", in A Taste of Thyme: Culinary Cultures of the Middle East (ed. Sami Zubaida, Richard Tapper), 1994. p. 89. 1 2 NTV MSNBC. "Charles Perry:Baklava Türk tatlısıdır" (in Turkish). Retrieved 2009-03-31. 1 2 Arab Studies Journal. Georgetown University. 2001. p. 115. Retrieved 2009-03-31. 1 2 Ken Albala (2011). Food Cultures of the World Encyclopedia. ABC-CLIO. pp. 307–. ISBN 978-0-313-37626-9.